More than 100 advocates, family members and friends chanted, “Drop LWOP, drop LWOP, commute all 5,000!” at an Oakland town hall on March 24, denouncing California’s use of life without parole sentences, also known as LWOP. 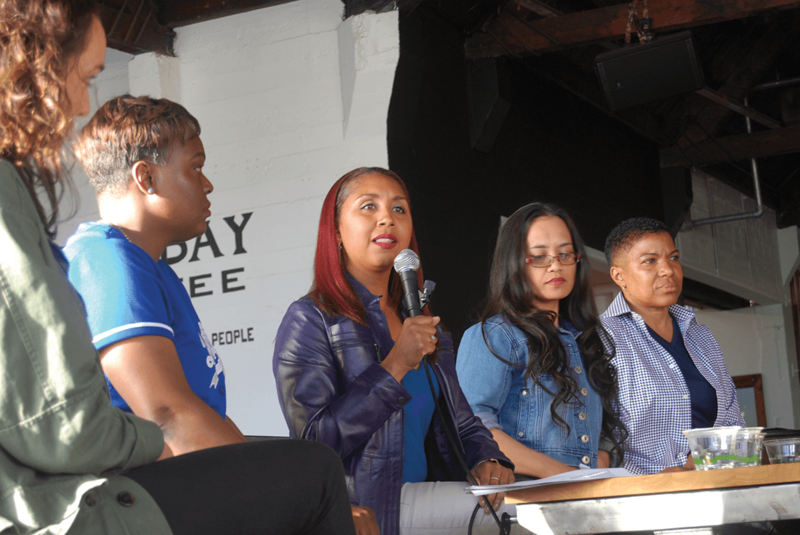 The California Coalition for Women Prisoners (CCWP) hosted the event to educate the general public and raise awareness about the state’s LWOP policies. California has approximately 5,000 prisoners serving life sentences without the chance for parole, according to the CCWP press release. “We believe that all people in California serving the inhumane LWOP sentence should be commuted to parole-eligible, allowing people a chance to go before the parole board,” said Adrienne Roberts, who works for CCWP and led the discussion at the event. “Ultimately, LWOP is a living death sentence and needs to be eliminated from the penal code,” added Roberts. Terah “Sage” Lawyer, Ny Nourn and June Lee — all formerly incarcerated women — shared their prison experiences and gave insight into the LWOP community at Central California Women’s Facility (CCWF) in Chowchilla and California Institution for Women (CIW) in Corona. Nourn was released May 2017 from CCWF after serving 16 years for a crime she said she did not commit, according to the newsletter. Nourn was convicted of first-degree murder and sentenced to life without parole. She appealed her case by submitting expert reports stating that she suffered from Battered Women’s Syndrome. Nourn was then resentenced to 15 years to life. After Nourn paroled, her ordeal was not over. Upon release, she was immediately detained by the U.S. Immigration and Customs Enforcement (ICE) and held in a detention center to face deportation proceedings. Nourn was born in a refugee camp in Thailand after her mother fled the war and genocide in Cambodia. They eventually came to the U.S. five years later as refugees. At her deportation hearing, Nourn testified that her former boyfriend was still threatening to kill her, and with the state of corruption in Cambodia, he can have her killed there for about $100. Nourn and her supporters believe she will be much safer in the U.S. In addition to speakers, the audience heard audio clips from women serving LWOP produced by CCWP’s “A Living Chance” storytelling project. There was a question and answer period with the panel. The audience then broke into smaller groups that focused on topics such as Strategies to Influence the Governor and Using Social Media in the Campaign. “People took away ideas for how to plug into the work and where their place is in the fight against LWOP,” said Roberts. “I think people were moved by seeing and feeling the emotional impact that LWOP has on individuals, families and communities. “I think people took away a better understanding of what it means to be sentenced to LWOP and the very limited options that people have for possibilities of freedom,” added Roberts. At the event, CCWP and CURB advocates commended Gov. Jerry Brown for commuting the sentences of 14 people and pardoning 56 to mark the Easter holiday. Among them were seven serving life without parole. The commutations included three people in women’s” prisons, two serving LWOP. Hearing the news of the Easter commutations, advocates became hopeful that LWOP sentences in California could be dropped for good, said the press release. After the event, guests took commutation postcards to distribute and many others committed to joining letter-writings campaigns of the Drop LWOP and A Living Chance Storytelling to End Life Without Parole.